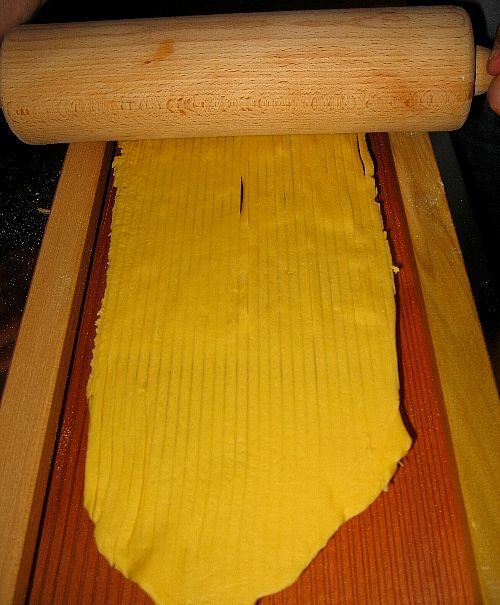 Pasta alla chitarra is homemade pasta cut using the instrument above. It's a kitchen guitar of sorts. It has 36 chords on one side and 72 on the other. When I opened the box yesterday I explained a friend I was about to realize an old dream. As I passed my hands over the chitarra's chords, he looked at it and asked 'So, you want to become a musician?'. He really meant it. And the chitarra really looks like a small harp, only much cheaper. The instrument and 3 cassetti asciugapasta, wire frames to dry fresh pasta cost only €44 from Centro Casalinghi near Mantova. Many people sell it in the US as well. It comes from Abruzzo where they call it carrature. 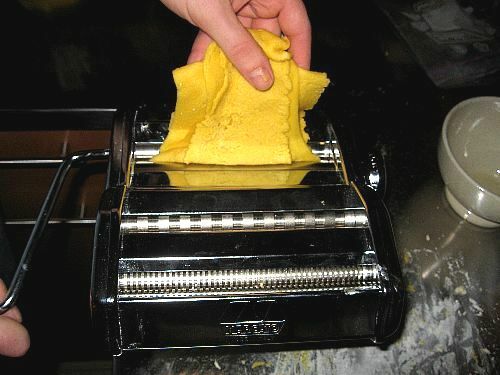 First you need to make fresh pasta. I made mine with about 100 grams of regular flour for each egg, but I think it would be best to use semolina for a harder, less elastic dough that cuts better. 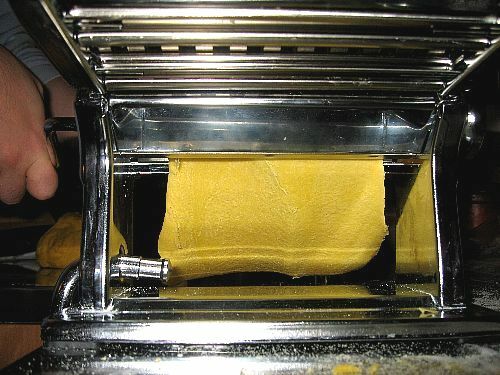 Then you laminate the pasta using the machine, folding it in two every time to get a smoother structure and no holes. Below you see the pasta sheet in the middle of the process, still not smooth. 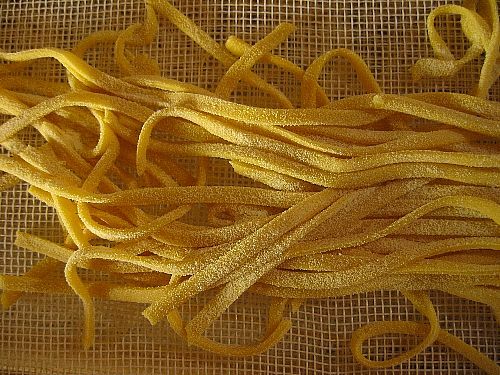 You lay a sheet of pasta on the chitarra and use a kitchen roll and your hands to press it against the chords. A bit like the movie Cube. Put a lot of flour on each side of the pasta sheet otherwise it will stick again as soon as it is trough. Press with your fingers. My first two batches were ruined on the other side of the chitarra, where cords are much closer to each other. The dough would just heal and make a whole sheet a second after it went through. I will try again some day with a harder dough. 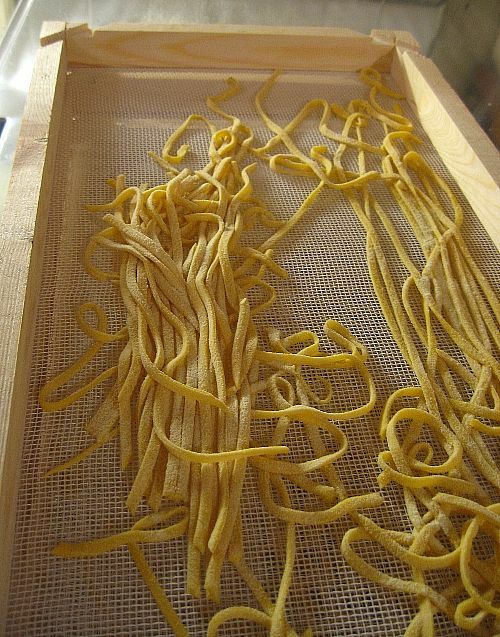 Remove the pasta and lay it on a floured cloth, or better, on pasta drying frames like I did here. Boil it about 2 minutes in salted water. Don't put any oil if you want the sauce to stick even better. <>È pronto! Here is my pasta served in a ragù. 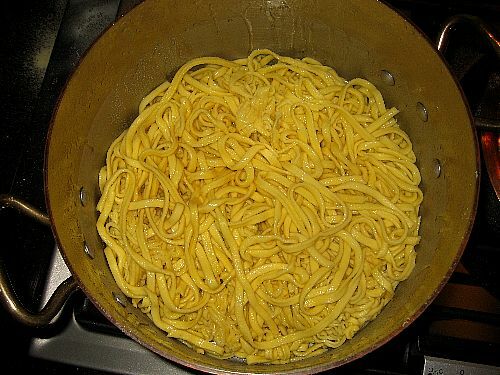 You need to separate the spaghetti one by one and leave them to dry. It is great fun! <>The spaghetti cook only 2 minutes in hot water. I made this batch with garlic, oil and chilies. Delicious! one? Or buy one on line? Thank you! It is a great utensil and definitely one people will talk about! Your pasta was really a very interesting idea ! 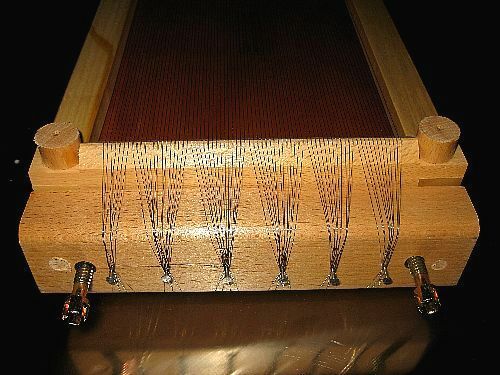 Great article and I have been trying to find where I can buy a Chitarra. I live in New Jersey. Is this the same chitarro you use to make mozzerella? 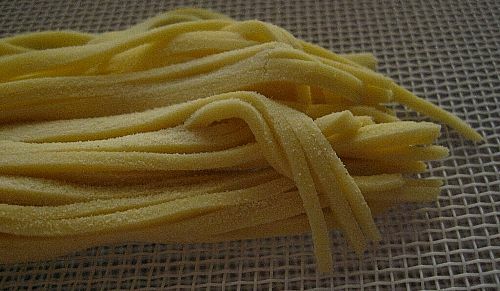 Marie Franzoi, this is a special chitarra just for pasta. You need the correct width. It is not the same used in cheesemaking. Thank you Risa for this lovely expression - a "pasta harp". I love this! You can buy chitarras on Ebay and several people sell them quite cheap in the US. Happy pasta making! Your site is great! great ideas and pics. I just purchased a Chitarra and I am not getting great results. 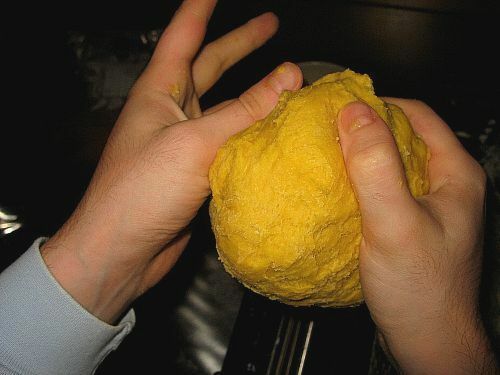 After kneading the dough with the pasta machine, then laying it on the chitarra I use a rolling pin on the dough, but it doesn't seem to cut all the way through and the dough just seems to stay stuck to the wires. What am I doing wrong? John, the trouble you have with the chitarra is normal and I had the same. If you can't cut through the pasta either it's too thick, too dry, the chords are not tight enough or you are not applying enough pressure with the rolling pin. 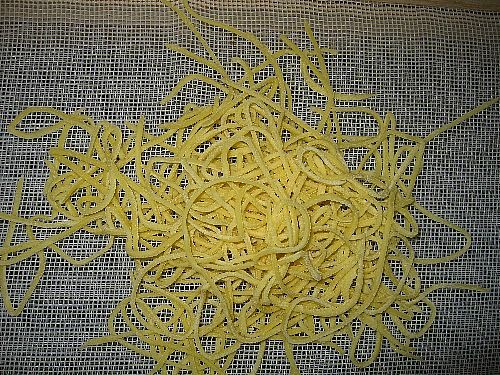 As for the pasta that sticks to the chitarra, you can either sprinkle your pasta sheets more generously with flour before cutting them, or make a slightly dryer mix, or just let the sheets dry for 20 minutes before cutting. Keep plenty of flour to sprinkle on top the pasta as it is being cut. Good luck! I think I had bought them from Il Toscano in Italy, but it's not so simple to order from them if you are abroad. Hello, I'm looking where I get a "chitarra" as a sign the page and how much. I really loved your article. My husband just had a chitarra shipped to me for my birthday, from Fantes Kitchen Wares Shop in Philadelphia (fantes.com). It didn't come with any instructions, and there were very limited ones on their web page--so this article was a godsend. The only thing I did different was roll my pasta sheets by hand. My first batch went smoothly. FX's answer→ Melanie, how thin did you manage to get your pasta sheet? 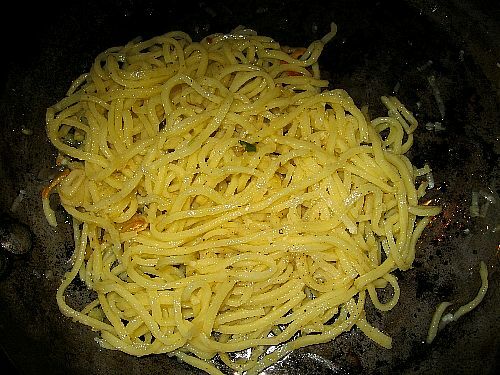 We spoke through email many months ago about pasta gadgets. I want to buy a pasta guitar. Fantes website sells 2 different kinds. One made in Italy and one made in the US. The one made in Italy looks like the board underneath that catches the pasta is slanted so it will slide down and out. I'm not sure how important this feature is and if the US made one has the same slanted under board i=or if it is flat. Can you make any recommendations. This is a gadget i only want to buy once. Thanks again for a great site as always ...you are my favorite recipe site! FX's answer→ Stacey, I apologize for the late reply. I only own one chitarra, and haven't seen the others you mention. But the main thing is that you can keep the strings tight and how many strings there are (size of your pasta!). Let me know how it works for you when you get your chitarra! wonderful! it were thousands of years that i did not see those kind of manual tools for pasta making ;) Now we just use the machines (like the one that you are using in the third picture) with special cutting blades. FX's answer→ Monica, la puedes comprar en Ebay me parece. My family has a chitarra. My grandmother received it for a wedding gift so the chitarra is approximately 90 years. I would try to describe it to people but they still would not understand. My grandmother would roll the dough herself and then roll it on the guitar. I saw a picture in the magazine and I could not believe that they are still being produced. Bought my chitarra at Fante's in Philly - i think they have a web-site. 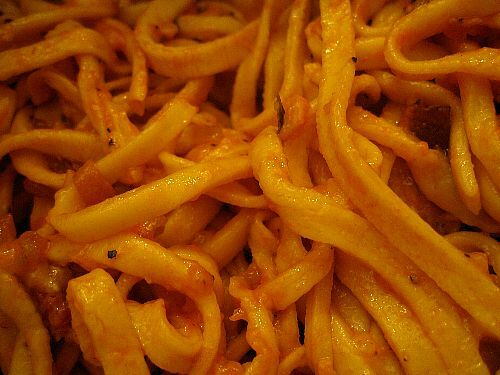 The texture of the pasta is amazing! I used half semolina, half all purpose flour and three eggs per 2 cups of flour mixture and and about 1 tblsp. of olive oil. 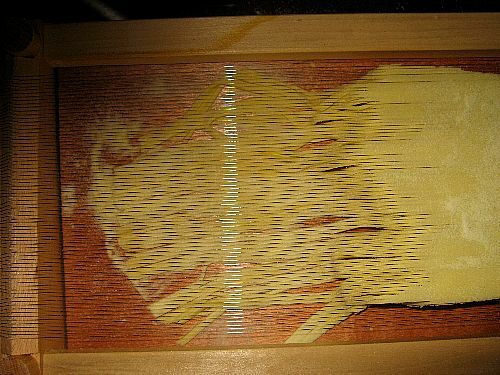 I let the sheets dry about 15 minutes before using the chitarra. I served it with clams and bay scallops with wine wine and garlic. Simply amazing. Hi! For some reason I have not gotten updates from you. Can you please put me back on the list!! Hope you are well. I did a search on chitarra and wound up here. Happy to see you! Get me back on that list! I have just inherited my grandmothers Chitarra, on one side it needs to be restrung. My husband was looking for information on restringing and came across your website. Thank you, I went to "fantes.com" where I found what we were looking for. I also inherited my great grandmothers "stick". It is the long wooden handle used to roll out the pasta dough. Today I had the privilege to teach my granddaughter what I learned as a child. 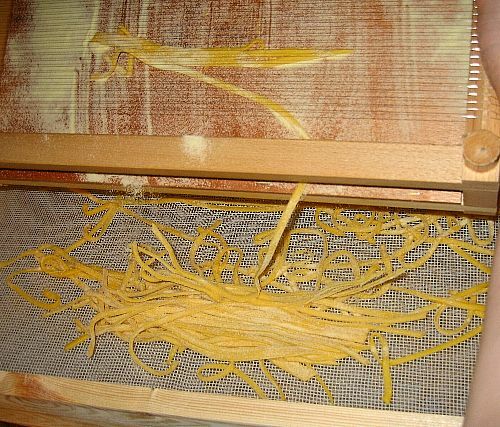 In response to a writers problem, after I roll the pasta on the chitarra, what does not fall I use a pastry brush to brush it down, it works well. 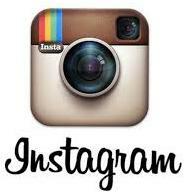 Would you mind if I use your photos of your chitarra? I am writing an article about Central Italian food at the moment. I included the web address of my first article about Souther Italian food so you could see what I do. I will of course give you credit and a link when I publish. 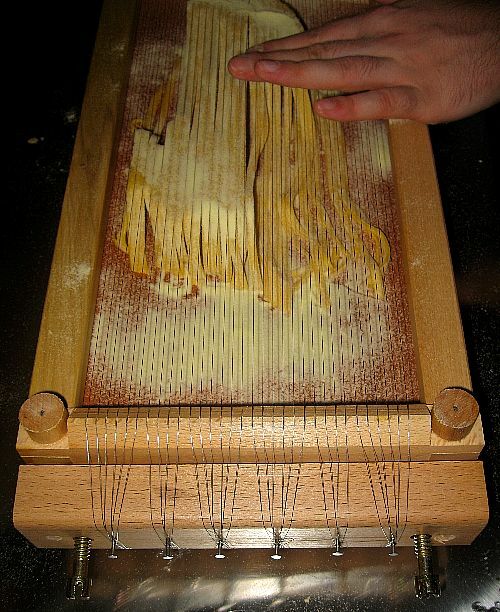 I WOULD like TO BUY A '' PASTA ALLA CHITARRA MACHINE '' IN TORONTO, ONT. I WOULD like TO PICK-IT UP MYSELF, DO YOU KNOW, PLEASE, where I CAN GET ONE. THANK-YOU, Gino. My son will love this !!!!!!! quite the pasta maker,and loves old Italian traditions !!! FX's answer→ Thanks I hope he got around to trying one! thank you for the beautiful pictures and directions. FX's answer→ Some people sell it in America, imported from Italy. 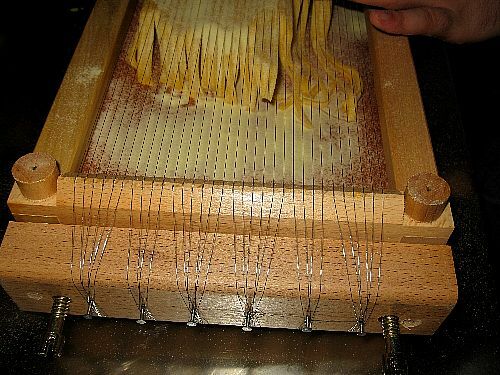 where can I purchase a chitarra pasta maker.